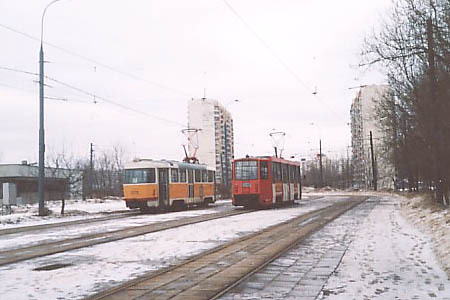 The south edge of Moscow tram network is situated in South Chertanovo district at Ulitsa Akademika Yangelya reversing loop. 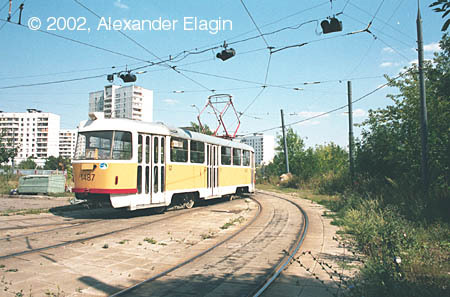 This loop was a final destination for a tramline that previously had its terminus at Ulitsa Krasnogo Mayaka loop in the same district. The extension was constructed in 1972, and regular service was begun on February 1, 1973. There were more ambitious plans to extend this line even farther to the south, to new large residential district Butovo that is situated beyond the Moscow outer ring highway, but those plans have never been implemented. 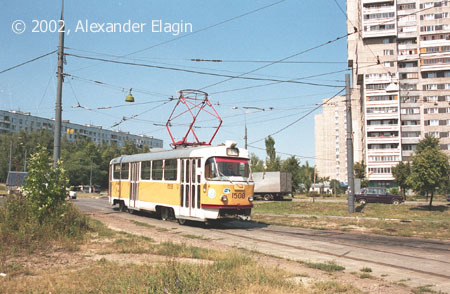 Instead, a 'light metro' line has been constructed in that district in 2003, but it has nothing to do with a conventional tram or 'light rail' - it is just a regular heavy metro line with slightly weakened technical requirements to reduce construction expenses. 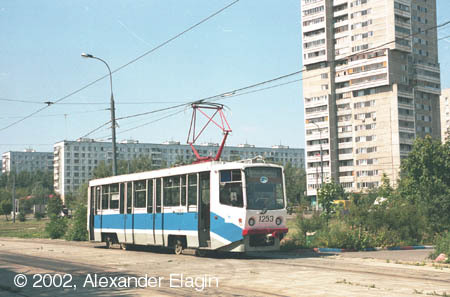 Tatra T3 #1508 at the home points of the terminus. 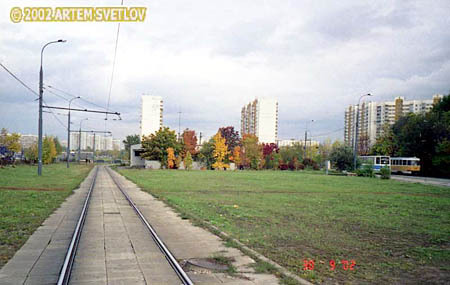 The terminus is located at the boundary between residential area and vast Bitzevskiy forest. The terminus is rather large, it consists of three long tracks. Trees of Bitzevskiy forest come close to the very tracks. 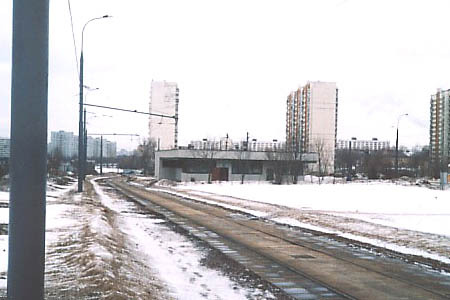 The tracks of this loop are located along Akademika Yangelya Street. It would be very good idea to extend this line a few hundred metres to the east to a new Metro station of the same name, or even farther - to Krasniy Stroitel railway station. Such a link could be very popular among commuters, but the city planners are very sceptic regarding its possibility. The terminus is equipped with a signalling system like many other tram termini in Moscow. But this system was apparently not functioning when I took this photo. The control room is located in this building in the centre of the loop. As usual, this building also hosts a rest room for drivers and other service facilities.